As I get older and the past starts to meld together into one amorphous blob, I find it helps to associate each year with the most important thing that happened. So when I think back to, say, 1999, and remember that that was the year I graduated from college, and remember that 2004 was the year I got married, not only are those dates placed in context again but I can place a whole host of less important events just by association. The funny thing is, though, that I can’t always predict what the most important event of a year will be until well after it’s over. For example, it should have been a foregone conclusion that 2008 would be remembered as the year we said goodbye to Scotland and moved to Seattle, but lately I’m beginning to have my doubts. Instead, there seems a pretty good chance that it will actually become known as the year I made jam out of everything that crossed my path. It started in April with the mandarin jam. You remember that, right? I tasted a wonderful citrus jam in Calabria and despite only having the vaguest clue what I was doing, I simmered and skimmed and ladled until I had enough glistening orange jars on my shelf to make an Italian grandmother envious. Fast forward to late July when Manuel and I were down in Portland visiting my dad, and we decided to go berry-picking one morning. Whether it was the hot sun beating down on us or the temptation of all the heavily-laden vines responsible for clouding our judgment I can’t say, but we ended up at the weigh scale with thirty-two pounds of berries, far more than any of us had intended to pick. ‘Oh don’t worry,’ I told everyone, my nonchalance surprising even me, ‘I’ll just make jam out of whatever we can’t eat.’ And indeed, the next thing I knew I had spent eight hours in the kitchen and there were sixteen pints of jam cooling on the countertop: raspberry, boysenberry, raspberry-boysenberry, boysenberry-lime, and raspberry-nectarine. “Well, I don’t think we’ll be buying any jam for the next couple of years,” my stepmother laughed nervously. Any sane person would have probably called it a day, but gripped by some kind of pioneer waste-not-want-not fever, I found myself unable to pass a fruit display without my mind starting to run rampant over the preserving possibilities. Before I knew it I had rounded up everyone again for a visit to the U-pick peach orchards, and after picking as many Red Havens as we could carry, once again I disappeared into the kitchen before anyone could stop me. The result, needless to say, was enough jars of peach jam to see multiple households through at least one long, peachless winter. Next up, of course, were apples, and by now I was on a roll. The first crop of galas had scarcely hit the farmer’s market when I found myself hunched over the stove again, churning out four pints of smooth, spicy apple butter. I actually was intending to make twice as much, but I had to cut the fun short when I suffered a freak jamming accident, which happened when a walnut-sized missile of boiling apple butter met the back of my hand, leaving a large and extremely painful second-degree burn (mind you I was standing four feet away at the sink at the time!). “Does this mean you’re finally going to stop making jam?” Manuel asked balefully, his eyes traveling from the overflowing pantry to my red, swollen hand. Smiling as brightly as I could through the pain, I offered him a deal: if he didn’t like what I made next, I wouldn’t preserve another thing for the rest of the year. Luckily, though, I’d saved the best for last. I can’t say for sure whether it was thanks to the accumulated expertise of half a year of intensive jam making or just a little dumb luck, but as soon as that burn healed I whipped out a pot of pear-cardamom butter that blows every other jam I’ve made out of the water. It is SO good, I haven’t yet brought myself to give a single jar away. Even Manuel agrees; he’s plowed through two and a half jars already, spreading it on cream cheese-covered bread topped with a pinch of maldon salt. I think its simplicity is its key; with nothing but pears, lemon juice and a touch of cardamom, each of the flavors has the chance to shine, and really, if you ever needed proof that pears and cardamom have the same kind of natural affinity as, say, apples and cinnamon or tomatoes and basil, here you have it. The stuff is absolutely incredible on toast and yogurt, and if you think you’ve ever met a better match for a piece of sharp white cheddar after dinner, think again. Wars have been fought over things less delicious. Oh dear, I think I need to make another batch. I’ve called for Bartletts here, since that’s what I used, but I imagine you could use just about any juicy, flavorful variety of pear. Just wait until they’re fragrant and barely yielding to the touch to get the best flavor and texture. And if you have a way to grind your own cardamom now is the time to do so; pre-ground loses its fragrance so fast it’s not even funny. If all you have is pre-ground, you may need to up the amount; taste the butter when it’s almost done and see what you think, adding a bit more if the flavor needs a boost. p.s. For an intro to fruit butters, have a look at this post. Heat the oven to 225F/105C and place your jars (not the lids) inside. Wash the lids with very hot water and let them dry on a clean towel. Peel and core the pears, and cut them into large chunks. Put them in a large nonreactive bowl with the sugar and let macerate for at least 2 hours. They should expel a lot of juice. Pour the pears and their liquid into a large, heavy-bottomed pot. Stir in the lemon juice and cardamom. Bring to a boil over medium-high heat. With a slotted spoon, skim away any scum that rises to the surface. Lower the heat to medium-low and continue to cook for about 20-25 minutes, or until the pears are completely soft and starting to fall apart. Remove from the heat and with a hand blender (or in a normal blender with the lid clamped down tightly), blend the mixture (in batches, if necessary) until smooth. Return the pot to the heat and allow the mixture to simmer gently, stirring frequently to prevent scorching, until the butter reduces to a thick sauce, about 2 hours. It will never really ‘set’ like normal jam; to judge its consistency chill a saucer in the freezer and drop a teaspoon of hot butter on it. When it’s as thick and spreadable as you like, take it off the heat. Pour into your hot jars, seal tightly and process according to your preferred canning method. For tips, see here. I have never done this before. But Melissa, you are so convincing! I think I will finally try my hand at jam making, and this recipe will be my first. I am up at this ungodly hour((8am, athough the clocks went back last night, so really its 9), because I have 6 pounds of brambles from my garden in the freezer, and something needs to be done!You know, I made jam with my nana and my mum, and I have never ‘canned'(i use ‘ ‘ because I don’t think it would be called canning in Scotland if people bothered to do it) anything. Most people I know don’t either, we just use a warm jar and put a disc of paper on top of it, and it lasts for months. I know that the reasoning behind it is to kill germs that might develop into mold at some point, but I don’t know if I will ever actually can anything, I am too lazy! You have a great blogspot! I am inspired to try my hand at making the pear cardamom butter. Thanks for sharing. Love, love, love the combination of cardamom with pears; truth be told, cardamom with apples and plums are also combinations that I adore this time of year. I have always been wary of true canning, I have no idea why, and always just done "refrigerator jams" and chutneys. This looks so delicious that I might have to forgo my fear and put up a big batch. I’ve been making jam like crazy this year as well. I made gingerbread pear butter, spicy apple butter, elderberry jelly, blueberry preserves, wild blackberry & black raspberry jelly and some mulled apple cider jelly. I can’t wait for all the delicious homemade bread with jam. YUM YUM. I’ll have to try this recipe next year when pears are in season. OK but won’t it be at least the Year of Jam/Seattle? 😉 Looks great! This post just tickles me. I’m on my 4th year or so of making pear butter with cardamom and it’s decidedly the thing I can that demands the most requests. Sometimes I use a vanilla bean too, and I always use a nice sweetish Riesling. Does anything make the house smell as good? I usually pick up a whole box of pears for the project and end up thanking my lucky stars that I have a good food mill. You might want to try just skipping the peeling and seeding step in favor of the mill. If I had to peel and seed 35 lbs of pears, I would go nuts. Thank you for a wonderful Sunday morning read. Mmm. That looks so good. I have never canned anything before and I’m feeling intimidated. Perhaps this recipe will give me the courage to try something new! Thanks! Sounds like a wonderful jam. I made my first jams this year. They were freezer jams made from all the zucchini I had this year. Um, next time you post something enticing like this, could you remind me that I don’t actually own a pot large enough to hold 6 lbs of pears? Please?It’ll cook down, right? I so understand you Melissa! I go through phases of jam making myslef, although we don;t eat jam at all. They make great presents though and I enjoy the process. I think I will make this butter for my mother in law. She is Finnish and loves cardamom. Thanks for sharing…. Well, this is the kind of post I just have to comment on, beautifully written, funny and a recipe so tempting that I want to make it right now. lovely.could you post your recipe for apple butter?Chiquita, I basically used this recipe, only I made it smooth and added a few pinches of cinnamon, cloves and mace. Actually, more than a few pinches – next time I’ll be a bit more light-handed. Oh my! This does look very delicious & I love the pairing of cardamon with pears…….a favorite spice of mine! Cheers! Gracious! I don’t even really CARE for cardamom, but your beautiful story about this jam may entice me to try this recipe anyways. I think I may try this with some seckel pears, they are naturally a little sweeter so i probably would cut back on the amount of Sugar. I’ll let you know how it works! Having spent the whole summer in Portland making jam, preserves, jelly, fruit in syrup, applesauce, fruit juices, cider, etc, I love hearing about others who have had similar obsessions. I know exactly what you mean re: doing u-pick in portland. I went out for an hour to get some blueberries and returned home with 15 pounds. Delish! The farms around here make me so happy!One tip: try pomona’s universal pectin. (available online or at local natural grocery stores like New Seasons in Portland.) It’s not like ball or sure-jell as it doesn’t need to be boiled or cooked for a certain amount of time to set and I’ve had brilliant results using it for Asian Pear with Vanilla Jam. You get a good set without having to overcook your fruit, hence a fresher fruit flavor. A lovely post. It makes me think about how I must do something with those apples. There are also some wierd looking fruits developing on a tree that looks like a pear but the fruits are round. I have to do some more research into this. Thank you for the inspiration! I’ve always wanted to make jam but have never taken the leap. I’m inspired. I thank you. And I was so inspired by your last post on your spice "rack" that I’ve commissioned my mom (who’s just taken up wood working… cool, right?) to make a fabulous wall-mounted rack that hold those cute little tins. So stoked. For real, thanks for the inspiration and for saving my spice madness. we just found your blog and love it! thanks for the tasty recipe- we will be trying it soon!! Hi, I am Tennen-Perman,E-mail from Japan.I visited your site sometimes so far.You have a cool site. I linked your site in my blog.I administer a blog talking about cooking.Please link to my site in your ones if you like it.http://impact-cook.blogspot.com/thank you! I made this this weekend, the pear cardamom butter, and it is lovely. It began as a rather insipid beige color, but I persisted and it finally reached that amber glow, buttery and spicy. Very very nice. Melissa: Thanks for this incredible recipe! As good as it sounds, the end result is so much better it defies description.I used 7-8 crushed whole cardamom pods in with the maceration from the beginning and then added ground cardamom later as needed. If you can get whole pods, they really do have a much brighter, pungent flavor than ground. (buy a bunch and store in the freezer)As another poster suggested, I skipped the peeling/coring and simply put the whole thing through a food mill after the first cooking to remove the skins, seeds and cardamom pod remnants. I think that was a time-saver.I ate an entire jar in two days: over greek yogurt, spread on toast, and every other possible way. OK, I even ate it straight from the jar with a spoon (I dare anyone who has actually made this to say they haven’t done the same) <grin>A tip for those of us who find only rock-hard, unripe pears:: put them into a brown paper bag with a few bananas to speed things along. Sometimes it takes 4-5 days, but be patient it will happen! I’ve made your Tangerine Jam three times since you posted that recipe and it’s now our favorite. Thanks for giving us this new one! delicius i want to try it!!!!! Amen, sister. Jamming can become a total obsession. I see fruit in season and get an overwhelming urge to simmer it with large amounts of sugar. I wanted to recommend an incredible book, "Mes Confitures: the James and Jellies of Christine Ferber", which has become a point of departure for many of my jamming adventures. Enjoy everyone. I have been fixated on June Taylor’s pear vanilla butter for quite some time. Can’t get over it. Just ordered some more, in fact. But pear and cardamom…that opens my mind to new possibilities. You may have seduced me into trying my hand at making jam for the first time. Thanks! Hi Natalie – Hmm, I don’t really know what to say, apart from the fact that in real life my butter was more yellowish-tan than orange. Not sure why you’d be getting something greenish, but I suspect it’s just up to variation in the fruit. In any case, I wouldn’t worry about the color too much – it’s the flavor that counts! And yes, if you find it too sweet I don’t see why you couldn’t decrease the sugar a little, or alternatively increase the lemon juice to balance it. Thank you for your response, Melissa! I did another test patch this afternoon, only this time I used a stainless steel pot instead of my Calphalon stockpot – my husband thought it might have been the coating on the Calphalon pot that imparted the grayish color. But much to our surprise, the color of the new batch remained the same. Maybe it is the variety of pears after all, as you suggested.Btw, I didn’t change the sugar quantity in the second batch. The butter tasted just fine the next day when it was at room temperature or cold. Regardless of color, the butter is delish! I’m going to use the remaining pears to make more butter and give it away this Christmas. I’m thinking of making the tangerine jam as well – maybe use grapefruit? Both jams sound like the perfect pairing for my homemade pain d’epices. Thank you for yet another wonderful recipe! My batch just came out of the canner. I used red bartlett pears, and cooked them with the skins on then ran them through the food mill. 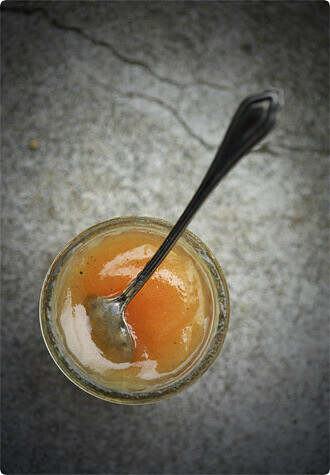 The red skins gave the puree a beautiful rosy color, which deepened into a gorgeous amber. I can’t wait to taste it! I made this using the pears from my trees (in NW Italy), and it was AMAZING. I don't usually like pears so much, but I can't stop eating this!